Do you leave feedback or reviews? You should! Here's why. Feedback pep talk ahead! Alrighty mamas, you can't hide, we know you love fluffy mail! We know you shop online and have probably order from various places. Did you know that you can and should leave feedback for each order and each product? It's super fun and easy, not complicated. Leaving feedback helps remind the wahms you order from that they're doing a great job and to keep up the good work and also helps promote their business by word of mouth and referrals. Leaving feedback for the products you purchase is also very important because future shoppers can read your honest review before investing in a product and they also know where to go to buy it. At Diaperpin it's never too late to leave feedback. 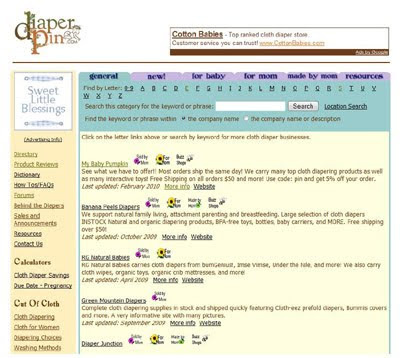 Simply visit Diaperpin's Directory page and search for the retailers where you made your purchases. Scroll down and read the reviews if you like or fast forward to the bottom where you'll see Post Your Review. After clicking on the Post Your Review link you may be prompted to enter or create a Diaperpin ID. If you have one sign in, if not then don't be afraid to create one. It's super easy and I promise you're not going to get a bunch of spam or get your email sold to the masses. Then all you do is leave feedback and hit "submit." Each time you leave feedback that business owner will be notified by email of your comments and I promise, we LOVE feedback. You will surely make their day by leaving your review. To leave a review for products purchased, like the Knickernappies Onesize for example, the steps are very similar. When on the Directory Page, on the left hand side you'll see a link that says Product Reviews. Click on Product Reviews and then find the category of the item you are looking for. In this case Knickernappies Onesize is a Onesize Pocket Diaper so you click on Onesize Pockets. Then you will see a list with star ratings of all the brands available. Choose the one you're interested in reviewing and click on it. Scroll down to Post Your Review and leave your comments. Be sure you also try to accurately list the store where you purchased the product so that they too can benefit from your review. You can also look for graphics on reatilers websites or blogs with the Diaperpin logo that say "Rate Us." Clicking through these links should land you right where you want to be so that you can quickly and easily leave your favorite retailers feedback! I hope this post helps you all. Now go! Run over to Diaperpin and leave your comments today! Cloth Diaper Laundry, One mama's wash routine.